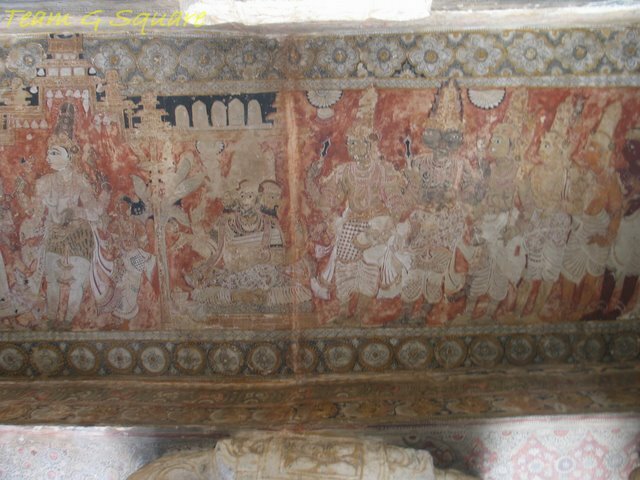 The high ceilings of Lepakshi are bedecked with Murals (ceiling paintings), depicting various mythological scenes from the Epics and the Puranas. 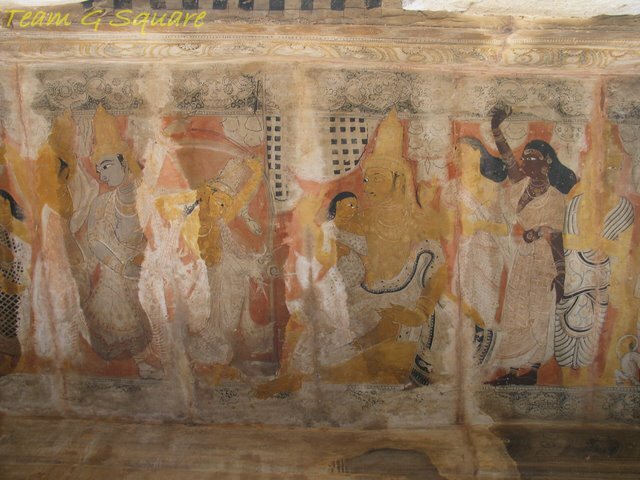 The Lepakshi Murals are a proof of the exemplary artwork of the Vijayanagar period. 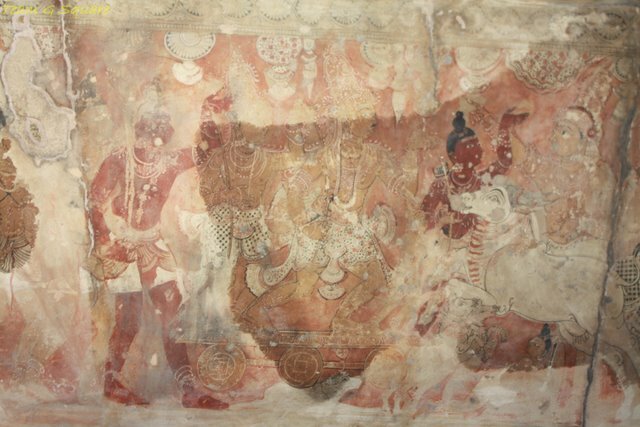 The paintings belong to the15th century and are quite well known among art lovers. 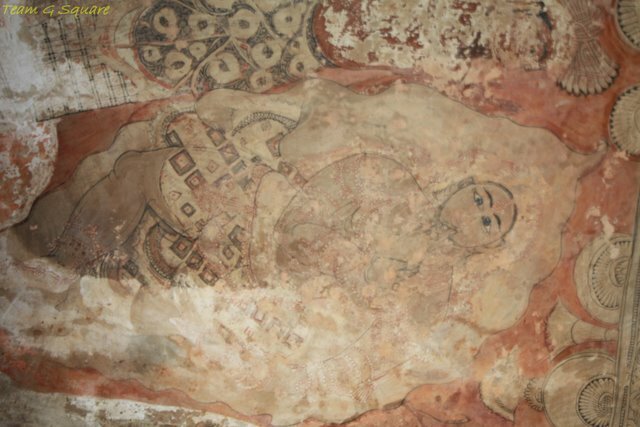 The Fresco technique of mural painting was adopted, and the source of colors were the naturally occurring dyes present in vegetables and flowers. 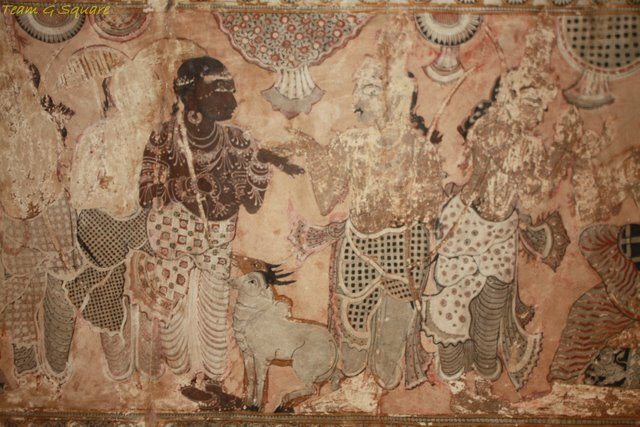 Though some of the paintings have retained its bright colors, most of them have become less vibrant and lustrous or vanished. 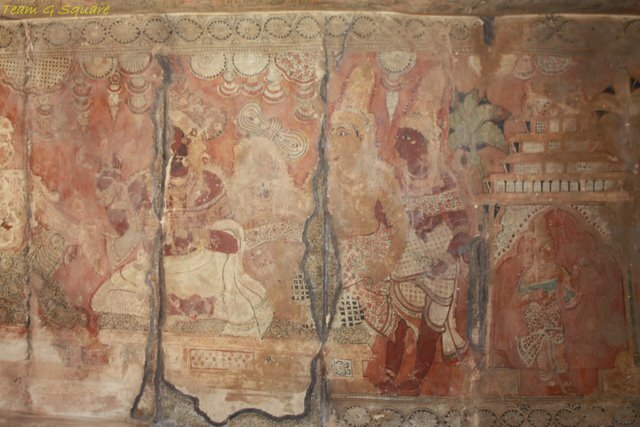 Sad but true, the paintings are failing the test of time and need some serious restoration measures.The panels are bordered by floral patterns, mostly in black, while the background color of the paintings is orange red. 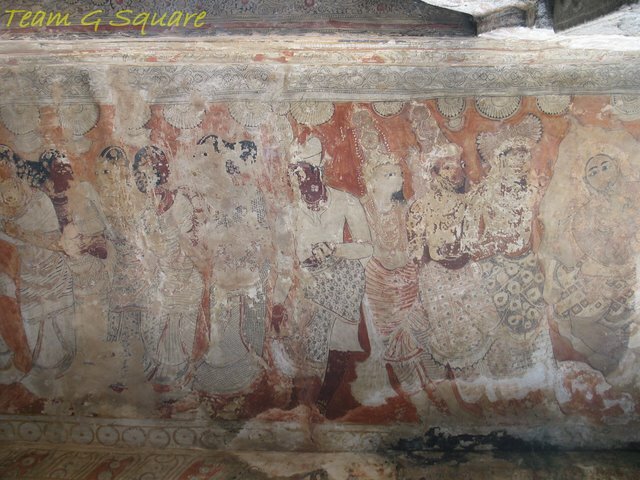 The above picture shows the panel depicting the Builders and Patrons of Lepakshi worshiping Lord Shiva. 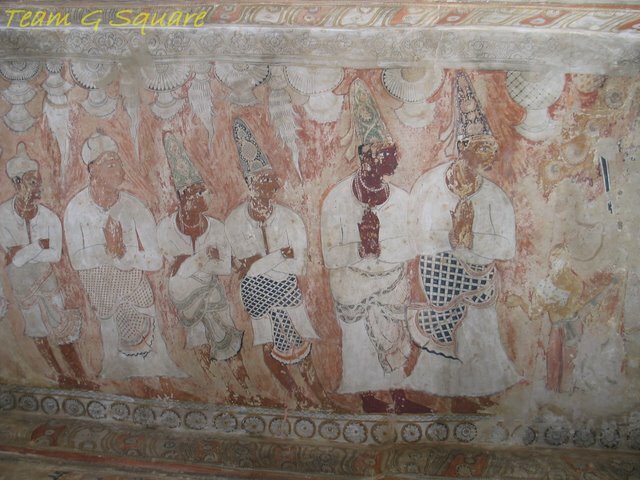 Note their tall head gears (Kulavis) and the style of their Dhotis. 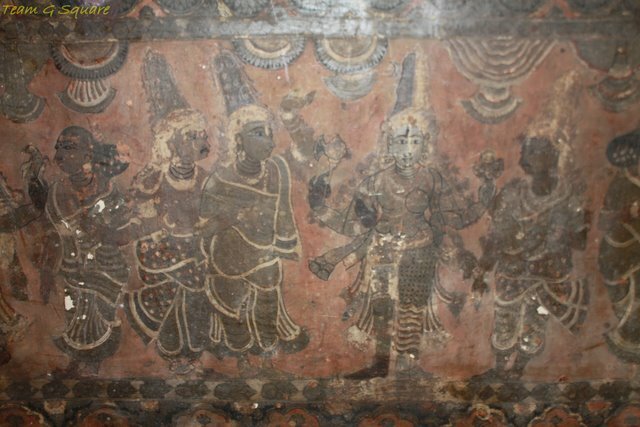 The above three pictures form the panel depicting the Swayamvara of Draupadi, the daughter of the Panchala king Drupada.Amongst all he contenders, it was only Arjuna, who shot the eye of the wooden fish fixed on a revolving wheel, while looking at the reflection in the water below and the consequent marriage of Draupadi with Arjuna. 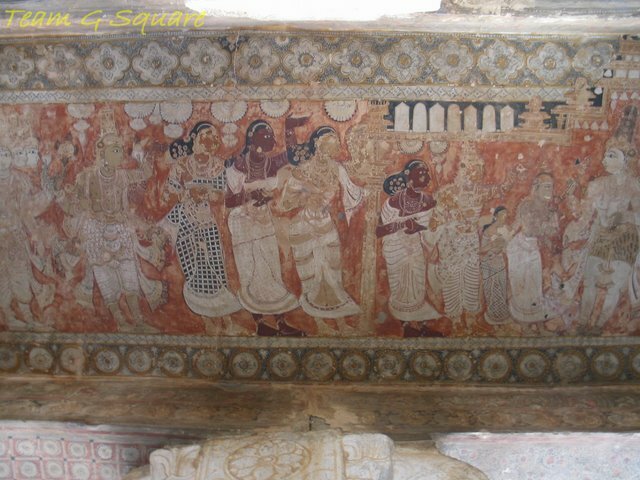 The above four pictures form the panels depicting Lord Shiva's marriage shows Goddess Parvati in the company of her maidens. 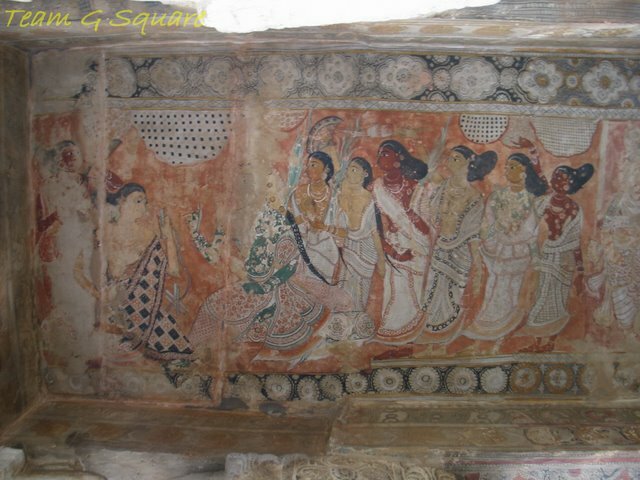 The hairstyles and costumes (clothing and ornaments) worn by the maidens are worthy being noted. The maidens are bare on their upper half. 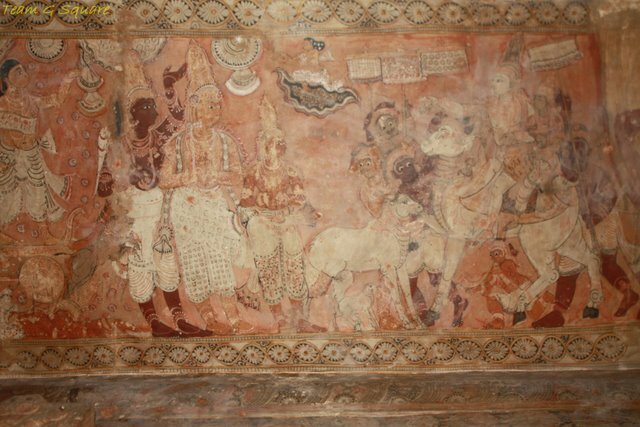 The panel shows Lord Shiva and Goddess Parvati, Lord Brahma, the priest of the wedding and the Ashtadikpalakas. 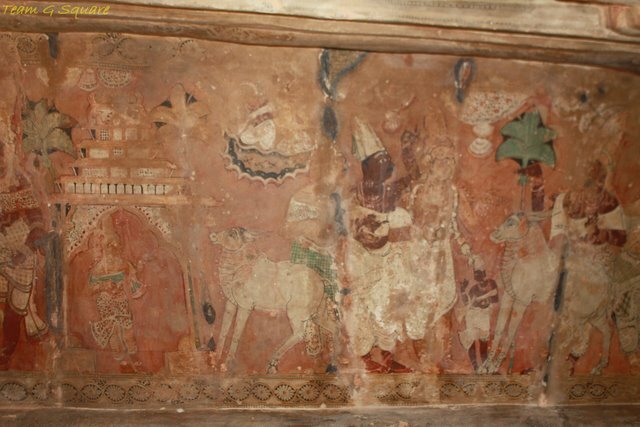 The above four pictures depict the legendary story of Manu Needhi Cholan, a righteous Chola king, who went to the extent of killing his own son in order to provide fair justice to a Cow. On knowing that a calf was crushed under the chariot of his son, the king ordered his son to be crushed under the same chariot in a similar way. The Cow was thus giver fair justice by this . who went on to punish his own son. 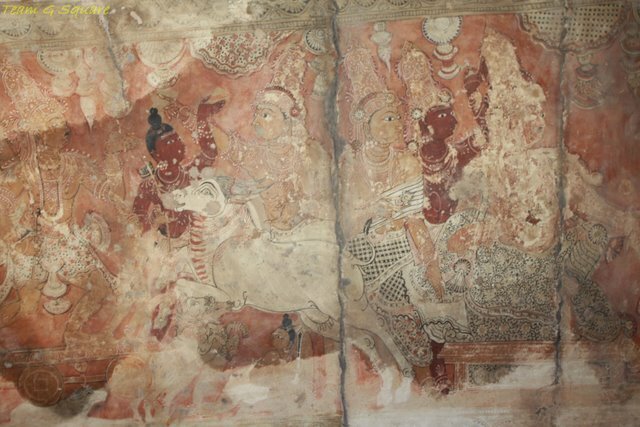 Being impressed with this, Shiva and Parvati come down to restore the lives of the prince and the calf. Such awesome art work and terrific captures as always! Thank you for sharing, it is the next best thing to being able to see them in person!! 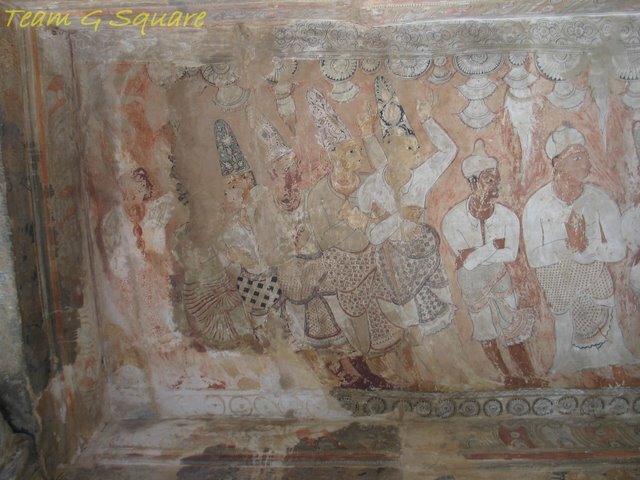 These frescoes are exquisite. I hope some way can be found to preserve them. 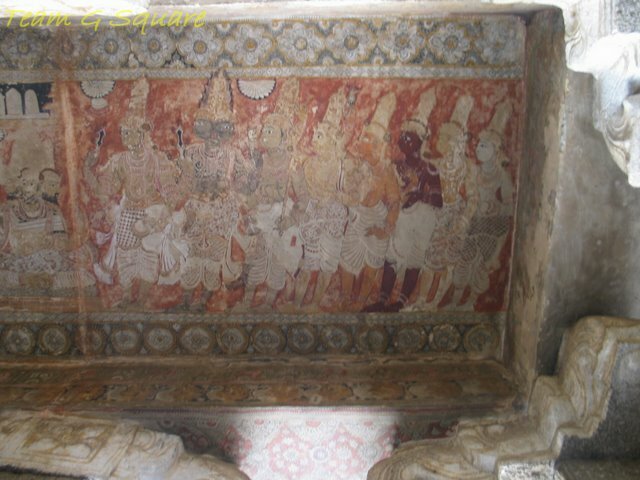 Those paintings in thge temple are beautiful. Awesome mural paintings. Nice post on it. Beautiful post, loved peeping into history through these wonderful paintings. I was just trying to imagine all of them in their true colors. It's really sad that we do not take care of our ancient treasures and allow them to wither away in this manner. 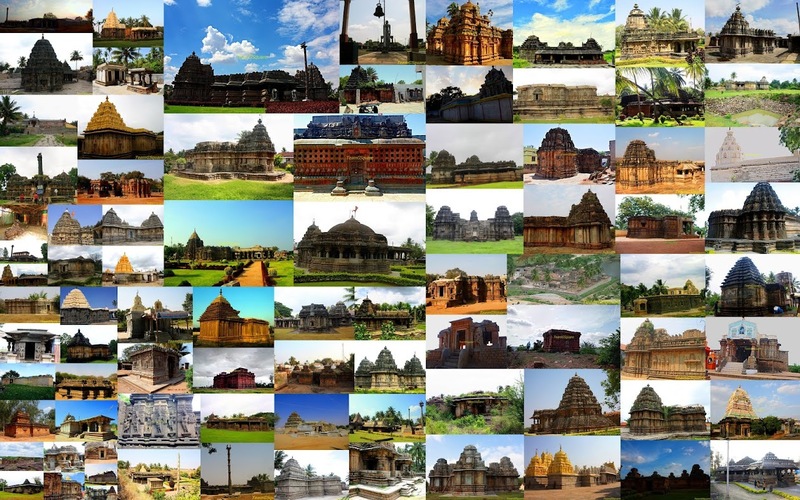 Amazing pictures showcasing the ancient life of India. Great captures. I have here. This is an awesome post. Also it made me regret for not having a good eye for art appreciation. Blame it on the educators , who only taught us history, Manu needhi chozhan, and not arts too. Another regret is not having visited this place. 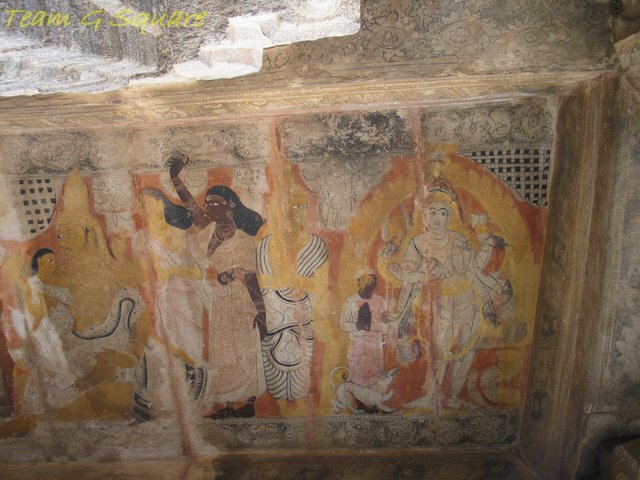 To appreciate our rich art heritage, the foundations need to be made in schools.Hope some one will . Ah! That was one of those things I always wanted - not all of us are able to see the paintings/sculptures and identify what it represents. Those captions make it possible to see the paintings in detail. Enjoyed the post. great paintings .. thnx for sharing this treasure ! Absolutely awesome post! I have been wanting to visit Lepakshi for a long time...unfortunately I have not been able to do so! 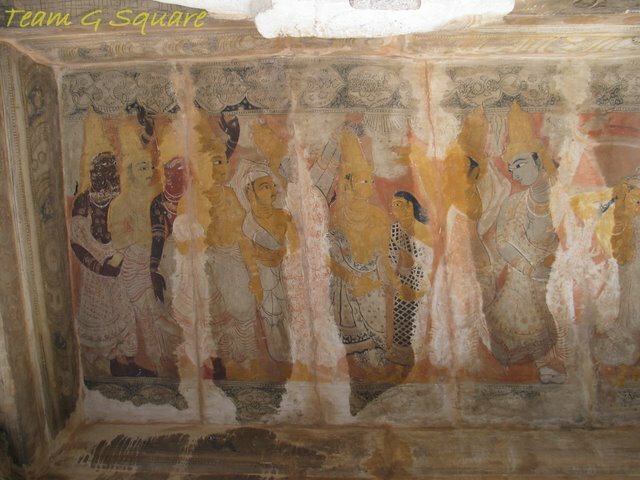 I hope these paintings will be maintained to enthrall people over many more years to come!